This athletes' stopwatch is made specifically for timing multiple racers at once. It supports an unlimited number of simultaneous timers which can be started, stopped, lap/split, or reset either individually or in a group. 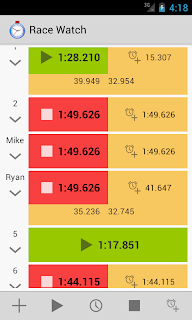 Designed for touchscreen phones and tablets without the physical limitations of a real stopwatch, so you can keep track of your whole team at once. The number of lanes shown simultaneously varies based on screen length. Most phones will be able to display 6-8 timers at once, while tablets will be able to display 16-20. 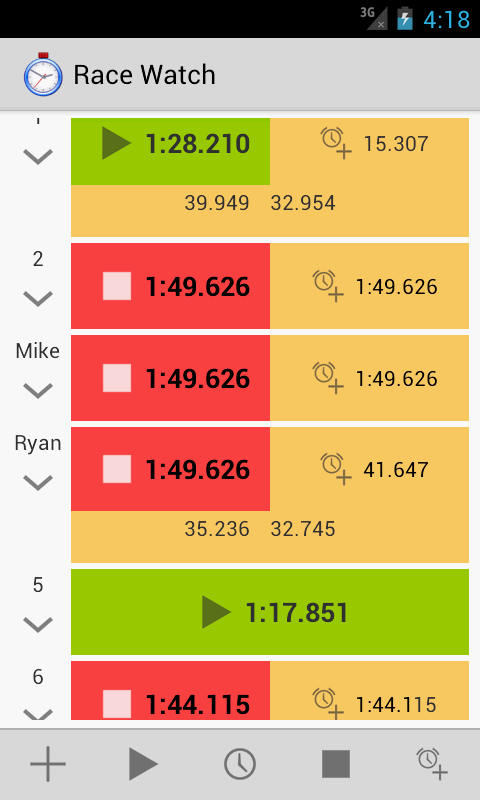 You can keep track of any race in any sport, whether you're watching NASCAR on TV, attending a college track and field event, or coaching your local high school swim meet. Supports races as short as sprints (down to the millisecond) up to and beyond marathons. Now available at the Google Play Store.